Irish cream liqueur brand Baileys will launch a range of baking supplies in partnership with ingredients manufacturer Clabber Girl Corporation, starting with Baileys chocolate chips. 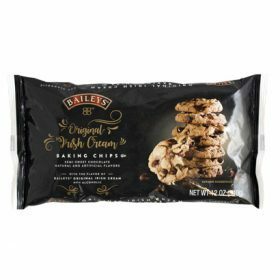 Baileys Original Irish Cream Baking Chips can be eaten “by the handful” or can be used to “mix into your favourite baked good recipe”. The chocolate chips are said to deliver the “flavour and smell of Baileys”, which is owned by Diageo. Gary Morris, president and COO at Clabber Girl Corporation, said: “Clabber Girl has been a trusted partner and friend to bakers and home cooks for more than 150 years. Alongside the product launch, a digital cookbook featuring 23 recipes incorporating the Baileys Original Irish Cream Baking Chips has been made available to download.